The London-based television company being investigated by Ofcom over a global news fixing row tried to “cultivate” a world-famous environmental economist and other leading opinion formers in the green movement for the documentaries it made for the BBC and other news broadcasters. FBC Media claims in its promotional literature that it targeted Professor Jeffrey Sachs, director of the Earth Institute at Columbia University in New York, to be an “ambassador” for its corporate client on programmes it made about the controversial palm oil industry in Malaysia. Mr Sachs, a special adviser to United Nations secretary general Ban-Ki Moon, was a prominent interviewee on a BBC World “Third Eye” documentary about Malaysia which was produced by FBC. The Independent has established that FBC was paid £17m by the Malaysian government to work on a “global strategic communications campaign”. The documentary was one of eight FBC programmes made for the BBC found to have been in “serious” breach of corporation editorial guidelines in a report issued yesterday by the BBC Trust. “The BBC has owned up to a “nominal fee” programming scandal in which viewers of 15 editorial programmes were hoodwinked by “serious” conflicts of interest of programme makers and a failure to declare that documentaries had outside sponsors. Undeclared corporate sponsorship, serious breaches of the BBC guidelines, etc. Mark Thompson is aghast, the BBC Trust’s Richard Ayre is no less aghast, deals have been ‘terminated’ and Ofcom is investigating. I hope everyone enjoys this brief segment on Today with Evan Davis. He discusses the new report from the Social Market Foundation which is highly critical of the Department of Work and Pension’s Work Programme to get the long-term unemployed back to work. Now, normally I’d say that any organization which has “Social” anything in its title is Left-leaning. I’d also generally say that any organization which states that they are not in favor of free markets but rather open markets under the guiding hand of government (a step away from fascist corporatism) is Left-leaning. But they have George Osborne and a couple of other non-Leftoids on their board and as associates, so they get away with the “independent” label and I can’t complain that Davis should have described the foundation as Left-leaning when he introduced its director. I can complain that there was something else missing from Davis’ introduction of the group, something that calls into question his very presence at the mic on this topic: Evan Davis is one of the board members of the Social Market Foundation. Davis has even co-written a pamphlet for the organization about the pros and cons of gay marriage. Yet no mention at all that of any association with the group, never mind that he’s now on the board. 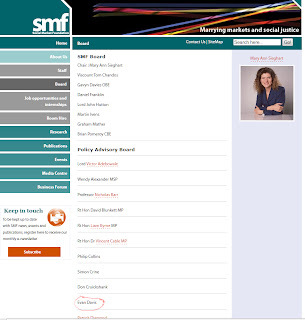 So the Social Market Foundation criticizes a scheme by the Conservative-Led Coalition, and one of their board members uses his position at the BBC not only to bring it up but to actually question the Government Minister in charge. 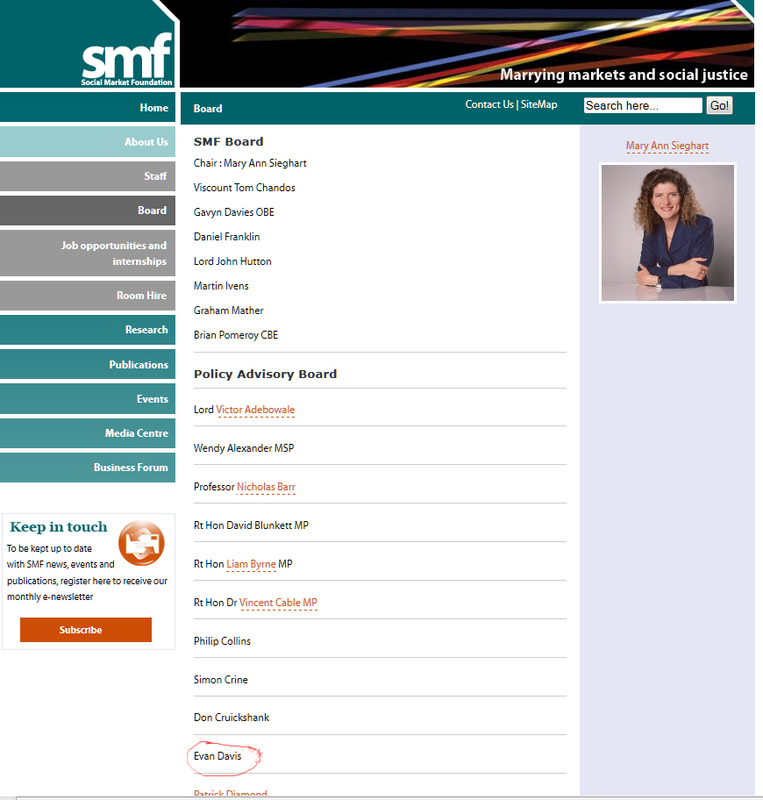 The director of the SMF gets his say first, but then isn’t involved in any debate with Grayling. Only Davis challenges the Government, without mentioning his conflict of interest. And no challenge at all to the SMF director’s statement. His challenging questions to Grayling come off as advocacy for the SMF position. At the very least, the Today producers should have made Davis recuse himself and had Justin Webb take the SMF’s side against the Government.